The positive effect of Florawall is scientifically proven and verifiable. Florawall formed the research topic of a diploma thesis, within which scientific criteria were defined and a test was carried out by an institute by the name FH Burgenland. Florawall was tested under laboratory control in a climatic chamber over a period of three months. The test was to reveal insights about subjectively felt effects and the impact caused on indoor climate under real-life conditions. It was performed involving a test group as well as a control group without any involvement of Florawall. The parallel setting allowed for making well-founded statements on the basis of both the laboratory and real-life conditions. A Florawall system allows for increasing the air humidity by up to 25 %, which is proven to have a positive effect on your health as well as on the subjectively felt well-being of all who work in the building. The study supports the thesis that Florawall helps reduce reverberation times audibly. This shows that having Florawall installed in offices, open space settings, lobby areas and meeting rooms is conducive to improving room acoustics considerably. This means that the Florawall system induces convenience or creates higher productivity. Photosynthetic processes help Florawall plants clean indoor air by filtering a whole range of air pollutants out of the air. They reduce the CO² concentration in rooms. The study also reveals that stress and sick-building symptoms can be curtailed and that lapses of concentration and tiredness can be prevented. 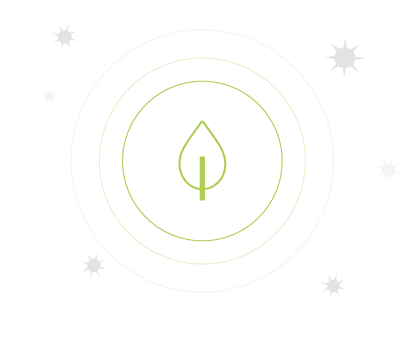 According to the findings of the study, symptoms like dry eyes, poor concentration, headache, an increasing number of sick leaves and absenteeism - in brief, all that is known by the name 'sick building syndrome' - can be treated markedly with a Florawall system. The alarming status quo in offices around Austria is far from what legal regulations stipulate in terms of requirements. The Occupational Health and Safety Act applicable in Austria stipulates an air humidity level of at least 40%. In effect, it is demonstrated conclusively that the majority of office employees struggle in the face of air humidity levels that range from 18% to 25% only. A climate that might still be bearable in the summer months turns out to be a torture latest when the heating period is started in the winter months. Owing to the research results it is now possible to calculate the size of your Florawall system precisely to suit your room conditions. 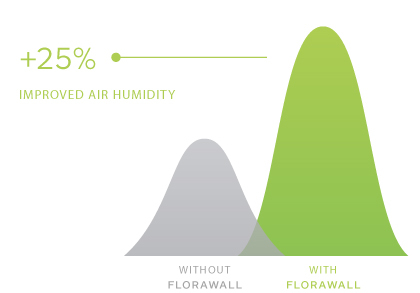 On the basis of concrete research figures we can now determine the dimensions of your Florawall exactly to achieve that, for instance, the air humidity reaches pre-defined target levels. In new building projects we use these indicators to scale down housing technology ahead of the implementation of your Florawall. Just a little bit more on this nasty CO² phenomenon: The study targeted both objectifiable measurements and subjectively felt well-being. Results led to a truly amazing insight: Installing a Florawall might well result in objectively reducing CO² levels, which has a positive effect on our bodily felt-sense, but humans are not able to verifiably perceive this reduction. Still, those who were interviewed within the study said that they were feeling better – something of a paradox. A possible way to explain this is by implying that the Florawall system has a subjectively sensed soothing and health-inducing effect on humans. In the end, it’s all the same: If figures show a positive effect on your health AND those impacted by the Florawall system feel better – there is something in it for all, isn’t there? Let us talk about your well-being!